When targeting Murray cod look for areas of structure such as submerged logs and rock bars in deep holes, particularly those at the base of rapids where fish actively sit in ambush. 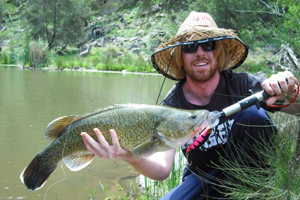 Murray cod are targeted from the shore or by anglers in small watercraft such as kayaks. They can be caught on bait but targeting them on lure is far more exciting and enables you to cover more ground in your pursuit. A reliable approach is to keep on the move, casting big lures into likely haunts and imparting a slow rolling retrieve, ensuring the lure is kept close to the bottom/structure at all times. The warmer months are better. You still get fish in winter but they become less active around April onwards. Murray cod will bite throughout the day, however early morning and evening still remain prime times. An ideal outfit for targeting Murray cod in rivers and streams is one that can deliver pinpoint cast accuracy as well as strength down low for muscling up on larger fish. Baitcasters are ideal in this scenario, which is why many Cod anglers opt for them as apposed to threadline outfits. An example would be a six-foot, 6-8kg baitcaster rod matched with a Shimano Curado, Daiwa Zillion or similar baitcaster reel. Braided line is preferred for cast distance and direct contact with the lure. 20lb Braid and 30lb fluorocarbon leader is not uncommon, more so for retrieval of lures from snags. Hook: Size 3/0 to 6/0 Octopus style. Sinker: When fishing baits limit weight as much as possible or fish unweighted. 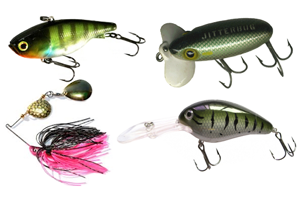 Large deep-diving, hard body minnows, large spinnerbaits, double blade spinnerbaits, lipless crankbaits, RT orange belly bluegill Jackalls, soft plastics, jitterbugs and other surface lures. Live Yabbies and Wood Grubs. 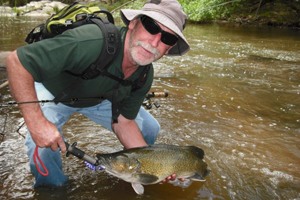 Murray cod are regarded as catch and release sport fish. This philosophy is encouraged. 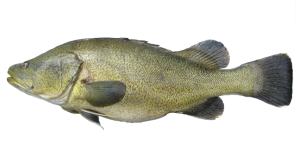 Murray cod, Australia’s largest native freshwater fish, are caught in western drainage rivers and dams in the south east of the country. 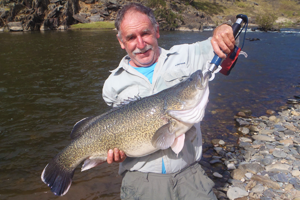 Whether targeted from shore or by light watercraft, Murray cod provide great sports fishing and will readily take a wide range of lures. Finding Murray Cod is half the challenge. Look for areas of faster running water, holes at the bottom of rapids, submerged rock bars and logs. 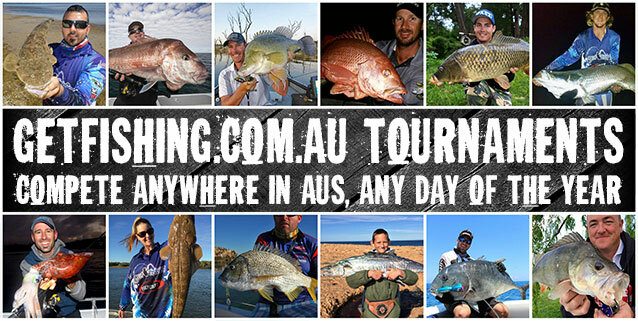 When targeting fish around rock bars, you can afford to apply less ‘hurt’ compared to fishing in the snags. The warmer are more productive. Quality of fishing backs off around April/May. Yeah you can eat Murray Cod, but the stock levels aren’t what they used to be. This magnificent, critically endangered fish is much better released to breed rather than end up on the dinner plate. When targeting Murray cod on lure braided line is preferred over monofilament for it’s casting performance, strike sensitivity, and for constant direct contact with the lure. Attach the mainline to a 1-1.5m fluorocarbon leader with a joining knot such as a Slim Beauty, Albright, Double Uni or similar. Attach the leader to the lure with a loop knot such as a Lefty’s Loop, Perfection Loop or Rapala Knot. The loop knot will optimise the lure’s action, allowing it to swim freely underwater. When targeting Murray cod with bait use as little weight as possible. In some situations no lead is possible, which is a great way to present natural free-swimming live baits. 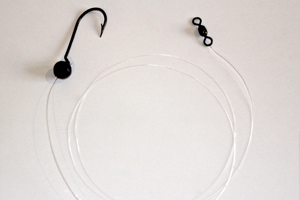 Hook to mainline as follows: Tie hook to a 1-1.5m fluorocarbon leader with a double-blood knot or similar. If using weight insert a running sinker onto the leader now. Connect leader to mainline using a Slim Beauty or similar joining knot, or alternatively use a swivel to reduce line twist, particularly for when fishing with monofilament line. Information courtesy of Jerom Stocks, Wollongong NSW. Photos courtesy of Jerom Stocks.